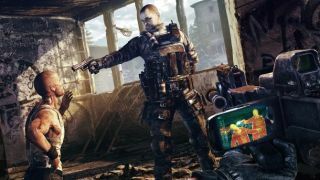 Blurring the lines between single and multiplayer modes is emerging as a popular game design trend—maybe because game developers played way too much Dark Souls last year. Titanfall , the next shooter from the developers of Call of Duty (who also caused some brouhaha today ), has been touting the feature since E3 2013, as did Ubisoft's The Division . Today, Farm 51 announced that it's joining the party with Get Even, its own photo-realism aspiring, single/multiplayer hybrid first person shooter. Farm 51 describes Get Even's as a mix between thriller and horror elements, allowing you to choose your own path through its story as you explore the memories of its central characters. As you play a single player mission, other players will be able to join your game as enemies, so you'll never know if you're about to face an AI or player-controlled enemy. That all sounds interesting, but the look of the teaser is the immediately striking thing. Farm 51 insists that while it contains a few live action shots, “all locations are actual parts of the game in the exact form shown in the teaser.” They were created using 3D scanning technology combined with advanced lighting effects. Below is a less hectic video of the same environment in the teaser showing off this tech. We've seen a lot of bullshots in our time, so we always remain critical, but if what we see here is representative of the final product, it'll be groundbreaking, at least visually. Farm 51 is composed of developers who previously worked on Painkiller: Hell and Damnation and Deadfall Adventures. It plans to release Get Even in 2015.